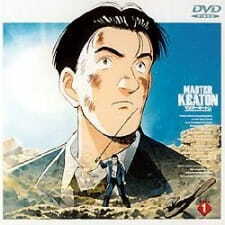 Master Keaton, the now almost 18 year old predecessor to Urasawa's Anime classic "Monster", is a massively overlooked show. (which is hard to say for certain, given co-writer Hokusei Katsushika sadly passed away in 2004). The premise of this show is a simple one, telling short adventure stories from all around the world of the 1990s, usually in some connection to historical and/or criminal themes. I will not say much more than that. The setting is very western and in that way, I might add, very well researched. It is a bit different from the usual anime, but if you know "Monster" you will realise what you are getting yourself into. Due to the episodic nature of the show a lot of the focus is on the characters. Anyone who has seen the first season will be very familiar with the main character Taichi, our japanese, part McGuyver, part Indiana Jones, part Sherlock Holmes, ex-SAS, professor of Archeology, globetrotting investigator and master of life, in short "Master Keaton". He is in fact so amazing, that there never is any time in the story for suspense to build up, because we all know "our Taichi" will probably find the optimal solution to any problem by the end of the episode. and his teen daughter Yuriko never fails to remind him of what his reckless lifestyle is costing him. However the whole family does share that same childish passion for adventure, making episodes focused around Mr. Keaton's family still fun to watch, albeit slightly more light-hearted. Then there is Taichi's partner, the very easy going and maybe careless insurance investigator Daniel. He is also nicely explored, taking the spotlight in a couple episodes and he makes a fun duo together with Keaton. It is easy to assume that this show was meant to be a direct sequel to the first season of "Master Keaton" (it being a 15 episode OVA), and that production was cut short for lack of funds. Do not expect a series that will blow you away visually, expect a series that sometimes looks good, but never offensively bad. The direction seems to be taking a quite practical approach, showing everything that needs to be seen. You will have difficulty finding many memorable shots, but looking for flaws would be futile. The soundtrack is lovely, high quality, mostly consisting of acoustic instrumentals, some being inspired by traditional scottish music (most notably the blasting bagpipes from the opening of course), some being more orchestral. The sound directing never appears too assertive (like in other episodic shows e.g. Bebop), together with the western style of the music just adding to the character of the show. I personally highly recommend the English Dub, since Japanese audio would only take away from the atmosphere. It is an internationally set series after all. All the different languages and accents are certainly a bit "funky", however not in a non-entertaining way, so I have to give a massive plus for effort in that regard. but there seems to be a bit of meaning to every story, which makes it very, very satisfying. In comparison to the first season of Keaton, I even think that the OVA is somewhat more consistent in creating interesting episodes. Especially in a time of so many mediocre new releases, "Master Keaton" has such an old-school, reassuring quality to it, making it recommendable to pretty much anyone. I would not consider this a must-watch like Urasawa's marginally younger work "Monster". Nevertheless, considering just how easy to watch this OVA is, you really have no excuse not to consider it next time you want to sit back with an episode of anime. One episode of "Master Keaton" is 25 min of your day well spent. my final score for it is a very good 84/100.